Bearberries, best known as Kinikinnik from an eastern Algonquian language, are Sagako minagunj, meaning "berry with spikes" in Ojibwe. In Hesquiat and Ahousat, of Vancouver Island, it's Tl'aqpt for the leaves, and Tl'itl'itlk'aqtl for the berries. At the left, here, where the berries have just ripened in late fall after a hard frost, it's not so clear why they were called spikey berries. These are some stiff, white or reddish waxy little flowers of the plant, which blooms in early to midsummer. Flowers appear in clusters of 3 - 15, followed in the fall by berries. Bearberry is a true shrub, with woody, branched stems, up to 2' long, but these stems lie flat, sometimes wholly or partly underground. Branches bearing leaves, flowers, berries are only a few inches high. The shrub often forms a dense mat on the sandy, gravelly soil it likes, from the Arctic Circle south to the latitude of Virginia, in North America, Europe and Asia. Pulled from the ground and silhouetted, we can see -- from the remains of the flower stamens that protrude from the berries -- where it gets its Ojibwe name of "spikey berries". The woody stem is being held at an angle for the photo; short branches with bunches of leathery, glossy evergreen leaves are what most people think is the whole plant. Bearberries are currant-sized, with tough skins (that survive a winter if no people or animals eat them) and a mealy white pulp that has 5 hard seeds inside. Eaten raw, they are dry, slightly astringent, and contain considerable protein -- making them a good winter emergency food for hunting or war parties. But bearberries were an important Ojibwe food cooked, being stewed with venison, which they imparted a slightly armoatic taste to, and where their rather bland pulp picked up flavors of the meat and other herbs and veghetables it was cooked with. Most attention has been devoted to the leaves. For medicinal teas, leaves should be gathereed in early autumn before the berries are fully ripe. Perfect leaves should be chosen, and they should be dried in a single layer in shade (because they are so thick and leathery, this will take several weeks). 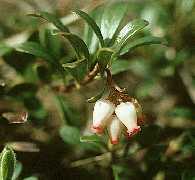 Teas made from bearberry leaves are astringent, tonic, diuretic and are a beneficial treatment for infections of the urinary tract, because some of their chemicals combine with chemicals normally found in the urine to form hydroquinone in sufficient quantities to be a potent germ-killer. A disconcerting side-effect (but harmless) is that drinking a pint a day (for several weeks, to treat such an infection) of a strong leaft tea will usually turn the urine green, if not, the tea probablh isn't strong enough. Although the tea contains tannin (like regular tea), it's not very tasty. It contains considerable amounts of magnesium, potassium, and calcium (minerals which may be hard to get enough of in winters or among people whose winter diets were mostly meat, like Inuits or Aleuts), so the tea is a tonic as well as specifically medicinal. 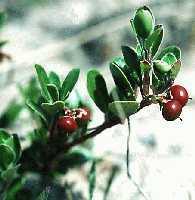 Phytochemical and nutritional analysis of bearberry, mostly substances in the leaf from the AGIS database. Click on any chemical for a list of human bodily uses or treatments, followed by a list of other plant species containing that chemical in some amount. 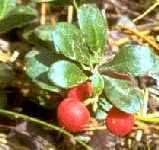 Multi-tribal uses of bearberry leaves, berries, roots, from the AGIST medical Native Aemrican Plants database. Click on any tribal use to get a literature cite to the report of that use of the plant. CREDITS: The logo photo and bearberry flowers are cropped and resized from the University of Wisconsin (Madison) botany gopher. The ripe bearberries in the ground are cropped from the TAMU herbarium image library.